I remember watching the Ride the Divide movie when the Peddler Bike Shop hosted a viewing of it at the Paradiso several years ago. I looked at Laura and immediately said, “I want to do that”. Since 20-30 days off work didn’t seem like a possibility I started looking into other opportunities. Irving may remember me asking him about some of these races several years ago. I know we talked about the Dirty Kanza 200 mile gravel grinder and some other race up in the midwest. We also visited about TNGA. The thought of doing it was intriguing but I didn’t feel like it was the right time. Early this year one of my good buddies expressed interest in doing TNGA and I jumped at the opportunity to do it with someone I know. I was able to get some decent riding in before the event. Several long rides during hot conditions. I also got to ride while in Wyoming in July which was nice for the climbing, views, and altitude. 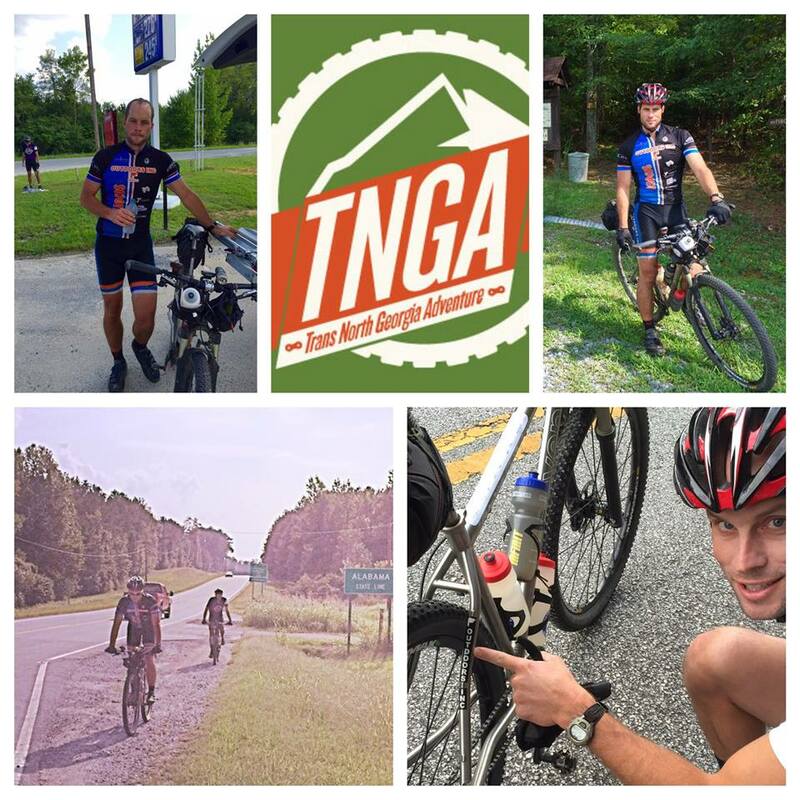 TNGA runs from the Northeast corner of GA, just outside of Clayton, GA to the western border of GA just west of Rome. It’s approx 350 miles of Fire service roads, single track, county roads, and highway. It includes about 50k feet of climbing. I left Memphis about 7am Friday morning and met some friends (Hank Campbell, Ron Philley, Warren Carroll, and Mr. Philley (Ron’s dad:Chauffer)) at Complete Cycle, a custom motorcycle shop near the border of GA and AL. Harold at Complete Cycle was kind enough to allow Hank and me to leave our vehicles there, the finish of TNGA, until we arrived by bike. We then drove to Clayton and had a dinner at Fortify. It was a nice restaurant picked by Ron. If you aren’t sure you are at a nice restaurant, you’ll know when they have homemade cheese and butter made with duck fat. I had to ask him if this was our “Last Supper” it was so nice. I woke up journey proud and ready to go around 5am. We had a quick breakfast at Chik Fil a and headed to the border, about 25 minutes up the road. The race director Derek Koslowski had a quick rider’s meeting where he gave a short tutorial on the SPOT GPS tracking devices and informed us that if “you thought you were dying you should push the “S.O.S.” button”, but if you suddenly decided you weren’t dying, you should definitely deactivate the button immediately as the minimum cost is upwards of $10k! It was a funny moment. The race started from the bridge on GA 28 at the SC border. We rolled out a mellow pace and a group of roughly 10 guys was together off and on for the first 10 miles or so. As the climbing and descending increased the group began to spread out. I was riding with Hank and a few other guys. I had secured my cue sheet (turn by turn directions with mileage as a backup to my GPS) in my back pocket but it managed to fall out on a descent early on. I stopped to get it while Hank waited. Then, probably 5-10 miles later while descending I lost a bottle. While I didn’t want to lose contact with the guys I was riding, I couldn’t spare a bottle for the rest of route. Hank was ahead of me and rode on not knowing what happened. I connected with Jason Murrell after 25 miles or so and had a good time riding with him. He is a veteran and was able to provide good insight as to what was ahead and where to get water. It was always nice riding with a veteran as it saves time and mental energy trying to decide where to go at each intersection. The GPS is easy, but not as fluid as following someone who knows where they are going. Jason showed me a cistern on the side of the mountain with nice clean water just flowing right out of a pipe. I filled up all five bottles and gulped one down right on the spot. We were at 41 miles and sitting probably 6th or so. I needed to make some equipment adjustments and Jason rolled on. Quickly after that I was on the road for a short minute until reaching the Tallulah river park. A group of four guys, three sewanee cycling team guys and one other guy, came by me like a freight train. With my SS gearing I was limited to about 12 mph so I had no chance to jump on their wheel rolling probably 20mph. I rode the next 20-25 miles solo and eventually caught up to Wayne(also a veteran) and then reconnected with Hank and Jason at a park at Lake Burton, 65 miles. Jason doesn’t stop long and rolled out. That’s they key to finishing fast, getting what you need and not staying stopped long. Hank, Wayne, and I rolled out together. We separated from Wayne but Hank and I stayed together from there to Helen, GA where we stopped at Woody’s Bike shop. Woody’s place was at about 100 mile mark and about 11 hours in. We arrived at 7:10pm. The support at Woody’s was amazing. I downed probably 16 oz of pickle juice(unicorn tears), 6 pickle quarters, 5 eggs, a coke, and rice cakes. Normally I don’t feel like eating after riding but had no problem throwing down food for most of the event. I got to talk to Laura on facetime which was nice. I also learned by text that Ron had been having issues with cramping and had pulled out of the event. This was a bummer but understandable. After probably 40 minutes Hank and I rolled out. Woody’s was just on the edge of town and didn’t offer much portable food so we made a stop in town and picked up some provisions for the night. As we rode out of Helen it was getting dark. We started up a 7 mile road climb that didn’t seem like it would ever end. It got fairly steep and I had to stop at one point for a breather. The descent was amazing. We were blazing down wide open highway as fast as I could coast. We then stopped at Vogel state park and refilled water, used the facilities, and I had a coke. At that point I was feeling pretty good. We connected with James, one of the Sewanee riders and rode off into the night with him. We also ran across Sam aka “Semi Precious”. Sam had some tire difficulties and had to get a new one at Woody’s. I think it cost him an hour or so. He also learned you can’t put sweaty wet dollar bills into a coke machine. I traded bills with him but his nasty thing is still in the bottom of one of my bike bags (TMI, I know, I’m reliving the whole thing). It stared raining at Midnight. We rode to Cooper’s Creek, 136 miles, and connected with Wayne who was hoping to wait out the rain. Hank was starting to get cold and expressed interest in staying put. With some encouragement he decided to roll on. I had changed to my smaller cog for the next 20 miles as the elevation profile was more mellow and I wanted to be able to keep up Hank, James, and Wayne. As soon as we started Hank realized his light was broken. We put my backup on his bike and got rolling again. The four of us were blazing the mostly downhill gravel FS roads. I commented to the guys that I can’t remember having so much fun riding. It was after midnite, pitch black dark, raining, and I was having a blast. Hank started really struggling with fatigue and looked like he was about to fall asleep but soldiered on for me. Finally at about 3am I started to fade as well. We were about 160 miles in. He and I parted ways with James and Wayne after learning they planned to tackle Stanley Gap before laying down for a bit. I got in my emergency bivy and tried to get some shut eye after setting my alarm for 45 minutes. At about 3:45 am, I woke up feeling more alert, got my stuff packed up and tried to get Hank rolling. He wasn’t having it and told me to roll on. Asaka trails/Stanley gap was only about 8 miles but was rough, steep, and physically demanding. The hike a bike was challenging. Hank left me a voicemail that he couldn’t sleep after all and was coming behind me. He called me soon after and told me he was on Stanley Gap and had to lay back down. It was rough! We had been told about a breakfast place in the Jack’s Creek area and I thought as I left Stanley gap I was arriving at breakfast. I also realized it had been three hours since I had eaten. I was completely bonked but hadn’t realized it yet. Before the race I loaded the route, divided into four segments, into my Garmin etrex 20. The etrex makes it super easy to follow the route. Well, I was arriving at the end of segment two and went to load segment 3, only to find out it had disappeared, along with segment 4. Thankfully, Lucas Charles had helped me to get the route loaded onto and Edge 810 I was using to track all the other details. In the process of trying to access the courses on the edge I deleted my ride history from the start to that point. So, I’m sitting at approx 170 mile mark, bonked, wet, cold, lost thinking breakfast was supposed to be here, having lost my nav files for my main garmin, deleted my ride history from the past 22 hours, and generally feeling like roadkill…..I was in a bad spot. I received some encouraging texts and while sitting in the road, literally on pavement in the road, Wayne and James roll up looking like they just came out of the spa. They had slept in a covered spot two doors down from where I was sitting. I think they must have had massages and slept on feather beds. I learned from James that breakfast wasn’t here, but about 12 miles down the route. It was actually 15. Being cold and shivering I was a little worried my core temp was dropping and decided to change clothes. The rain moved out before 3am. I think it was about 7am. I changed out of my wet kit and into my damp kit and rode on toward breakfast now navigating with my far inferior for this purpose Garmin edge. I almost passed up breakfast thinking it couldn’t be the right place. There was a sign out front welcoming TNGA riders but this was a rural convenience store (much like the one across from Herb Parsons was 10 years ago), not your town diner as I was expecting. Fortunately a nice woman named Deborah was out front and waved me in. I chowed down and got in as many calories as I could stand and stocked up for the day. The ladies at the store were awesome and accommodating. They were monitoring the progress on the track leaders website and gave me a report of who had come through and when. I think I was sitting fifth. They also let me know Hank was on his way along with Matt Sweeney. After about an hour (at least) I was ready to roll but didn’t want to leave with Hank being so close. Hank arrived and told me he was done. He had been sick leading up to the race and the rain brought it all back. I had planned to ride with Hank as long as possible so this was a downer, but also a relief that I could feel comfortable to ride my own pace, whatever that was. I know Hank was disappointed. He was encouraging despite his not feeling good. I informed Hank of my early morning woes and he and I traded Garmins. This was HUGE. I rolled out of the store about 10:35am as I recall. This was mile 183. The next stop was mulberry gap at mile 218 and it took me 5 hours to get there. I don’t recall too much of what I came across during that time. Mulberry gap is generally considered the halfway point even though it is beyond halfway. I had a sandwich, chocolate milk, a coke and laid down for 30 minutes. I felt terrible. While there I was able to gather some valuable intel as to what lay ahead. The course is so long its very difficult to keep it all straight and know what to expect without outside help, for me anyway. I learned that according to Eddie O’Dea (current record holder) it takes 12-14 hours of riding to get from mulberry gap to the finish. I’m not sure anyone who is not planning to break the record should take that as good info; however, I did learn that it was 20 miles of single track and 20 miles of road to Dalton, the major town along the route. Also the location of the second and last bike shop on the route. It took me forever but after two hours I gathered my things and headed back out. As soon as I was back on the bike I started feeling better. It was 5:50pm Sunday. One of the women at Mulberry Gap told me I would make it to Dalton before sunset, but I’m not sure how she got that idea. My goal was to be out of the singletrack by dark. I missed that goal by about 15-20 minutes. I changed gears from my 22 to my 19 and rolled to Dalton at a quick pace. I’d been craving Sonic since early on and ran across one as I entered Dalton. I was tired and thought a “meal” would be good so I stopped and chowed down on a burger, egg burrito, and cherry limeade. I ordered a corn dog too but couldn’t handle it. As I was about to get back on my bike I saw Jason Murrell ride by on the road. I jumped on my bike hoping to catch him. We connected at Bear Creek Bikes there in Dalton at 11:38pm. The store was nice and Shane, the proprietor was super friendly. He changed my gear back to the 19 and I laid down for 45 minutes. Jason didn’t stay. I decided it would be good to replace my socks as my feet had now been wet for over 36 hours. Matt Sweeney showed up while I was there and also laid down for a rest. I got on the road at 01:15am Monday morning. I was tired but alert and slowly pedaled off for the last 70 miles. As you leave Dalton it’s a roughly 3 mile climb to the snake creek gap trailhead. As you turn off the hwy you climb…ahem, walk, up an asphalt access road to an antenna. The road is so incredibly steep I don’t know how the paving machine managed to pave the road. I could barely walk up it. I entered the trail. I had been told the Snake Creek gap trail was gnarly and terrible. Chase commented on it several times. I got tips from the guys at the bike shop but it’s often difficult to process the information and file it away when you don’t have experience on the trail to visualize the info. I thought I remember being told the first three miles was horrible but then it gets better. After roughly 3 hours I had made it 7 miles from the bike shop. To say the trail was horrible would be an understatement. It would have been tough during daylight without a 40lb bike and having ridden 270 miles, but after all that, it was miserable. It was also 3am which makes things infinitely worse. I laid down for 10 minutes. I got up and rolled on. After another 45 minutes or so I was tired again but didn’t want to stop. I passed a perfect place to lay down, everywhere else was covered in rocks but this one spot. At that point I was helpless and asked God, “if you want me to sleep, give me another spot like I just passed”. I’ve never seen so many huge rocks in my life. The entire trail was gnarly. Immediately after that statement I came across another spot exactly as I’d passed, as if I’d ridden in a circle. I laid down and slept for an hour. I woke up on my own and packed up my stuff. I wasn’t excited about rolling out but I was alert again. As if on cue (I believe he was) Matt Sweeney came rolling through the woods at the exact moment I was ready to ride. I asked if I could join him and he obliged. He and I rode together the rest of the day. It was about 5:30am at that time. The ride from Dalton, GA to the finish is totally remote and 90% single track with a little fire road and 15 miles of Rails to trails/hwy at the end. There are no stores/gas stations, etc in between. There was one barn where we could refill with clean water at about 40 miles from the end. Think of Syllamo as a decent comparison, just add 20 miles. The riding went well and I had fun once we cleared the initial rocky section of snake creek gap. I refilled bottles twice from creeks and then one last time at the barn as we entered the last 40 miles. I was feeling a little low at that time and ate 300 calories or so. I then realized I only had two nut butter packets for what was another approx 4 hours of riding. Not good. I ran across a woman at the barn and asked her if I could buy whatever pickles (unicorn tears) she had available and understandably received a strange look. She didn’t have any pickles. She did give me diet coke and two bananas. Bam! That was what I needed. At this point my left ankle and both feet were really beginning to be bothersome. My left ankle started aching at around 160-180 but wasn’t severe. My right knee started feeling a little overworked around 200 miles. Hike a bike wasn’t good. Riding was good. There were some long climbs albeit not nearly as long as early on in the race. Laura and I were texting when I would stop to wait on Matt. He was running a 20 tooth rear cog to my 22. Laura asked what she could be praying for, I said, “that I don’t have to walk and that I don’t fall asleep”. I believe prayers were answered as I rode climbs I never thought I could at 300+ miles. Riding the easy sections made it hard to stay awake, particularly the last 15 miles. I think it was the rhythmic up and down of the pedals. Coasting was worse. Matt and I rode across the state line together at 5:37pm Monday. It was well behind my original goal but I’ve never been more satisfied with a result. It was one of the best experiences of my life. Matt was heaven sent and made the last day awesome. I learned just after finishing that my buddy Warren pulled out of the event at Mulberry Gap. Warren is a beast but was dealing with some significant foot blisters that were beginning to threaten his plans to train and complete an Ironman next month. It was the right decision. The support of my family and friends, the cycling community, complete strangers, my team, etc was amazing. It’s been overwhelming really. Thank you to all who texted, called, emailed, facebooked, and especially prayed. I couldn’t have finished without the strength only God can provide. I want to give a special shout out to Joel at Outdoors for getting my bike all setup and ready. It operated flawlessly despite rain, many creek crossings, and a general thrashing. I truly can’t believe the brakes lasted for the whole ride. Thanks Joel and Outdoors!